Do Mac users need to defrag their Mac? The answer for most Mac users is probably “No”. Apple says that it's new file system i.e HFS+ has the ability to defrag files of up to 20 MB file size. If you are working with video files, Photoshop etc. which contains large files then you must need some third party tool to defrag your Mac. You bought your Mac because you wanted to work with the best computer and you love to keep it's performance good. But, over a period of time your Mac, got fragmented and it decreased Mac OS X performance. 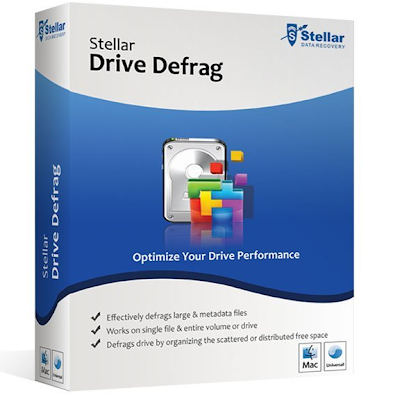 Stellar Drive Defrag software is one of the easy and reliable Mac defragmentation tool. It comes with bundeled with new features which is very useful to defragment Mac. When you start defrag your Mac volume with this tool, you get two options to monitor fragmentation status in Mac drive. The first, called Layout view, through which you can see the visual interpretation of the fragmentation on your hard drive and other is File view. You can even check the fragmentation status of Mac files by clicking over File view option. This tool allows Mac user to create/make bootable DVD to take defrag action on start up volume so that you always be on safer side in case of data loss situation. You can also optimize the free space available on your Mac hard drive, this tool helps you to keep all the free space at one place to avoid fragmentations. This process reduces disk head movement and thus increases the performance of your Mac. I like to recommend this Defrag tool of Stellar to all Mac users, ,who may find the extra functionality as well as people who use their system for video editing or photoshope. This tool helps to defrag entire volume. It defrags the metadata files in a Mac volume. Creates a bootable DVD, which allows you to defrag the boot volume. It helps to gather all free space into a contiguous block. It has temperature bar which allows you to check the fluctuations in Mac volume temperature at the time of defrag process. Metadata includes catalog files, attribute files, extent overflow, and allocation files and defrag. Stellar Drive defrag is very reliable and easy to use with 100% money back gurantee. Free version of this tool scan your entire Mac and show you result with fragmentation status of Mac hard drive. System Requirements: PowerPC or above or Intel Mac, OS X v10.4, 512MB RAM, 25MB free disk space Price: $39.